Quantity: #BLG Minimum 300 pieces; #BLGP3, #BLGP5 Minimum 100 pieces. For orders above catalog quantities, please contact your distributor for production time. Pen/Ink Color: Choose from selection shown. Please specify your assortment for the 3 or 5 pack. 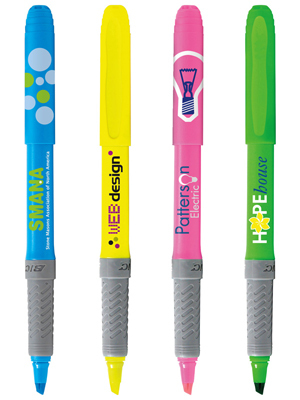 All highlighters include textured, black rubber grip. Ink color matches pen color. #BLG: Standard - 9 lbs. (approx.) @ 300 per carton. #BLGP3: Standard - 16 lbs. (approx.) @ 200 pouches/carton. #BLGP5: Standard - 17 lbs. (approx.) @ 130 pouches/carton. U.S. Patent Nos. 5,186,564; 6,485,211 B1; Des. 466,932 S and other pending patents.